The days of having to pay for video games are over. Generally, retail games are better because they're made with more effort and care than their free counterparts. But free browser-based game sites are insanely popular, specifically Kongregate, Armor Games, and the grandaddy of them all—NewGrounds. Despite not receiving funds directly from the players, they've become a profitable niche in the games industry. And that popularity has attracted more talent and money to the production of web games, consistently improving the quality of each new release. This article focuses on one particular casual game site that's followed a more narrow niche than any of the others, possibly producing better games than any of them. We're talking about Adult Swim Games. Aqua Teen Hunger Force Zombie Ninja Pro-Am, a 2007 golf title for PS2. Abject critical and commercial failure. Harvey Birdman: Attorney at Law, an Ace Attorney spinoff published by Capcom for PS2, PSP, and Wii. Marginally better than Aqua Teen, thanks to Capcom and gameplay that follows Ace Attorney's proven formula. Since then, Adult Swim has wisely and successfully turned away from big-budget licensed titles and moved into a space better suited to their off-the-wall sense of humor—original Flash games. It's the breakout hit that established the site. It has over 55 million plays on Adult Swim Games, and countless more on the other sites that host it, including Kongregate. The player controls an amateur surgeon, operating on a variety of misfit patients using tools like a pizza cutter and a stapler. Along with many other games on Adult Swim, this one uses cartoony graphics and humor to couch its grizzly subject matter. The effect works. I've had more fun with this game than I ever did with the more serious surgical games like Trauma Center (which actually costs money). It's the newest game on the site. It's Metroid meets Super Meat Boy in a browser, with ghosts and demonic posession added. Like in Amateur Surgeon, the visual style and music are instantly charming and help offset the implications of what your ghostly protagonist is actually doing—posessing the bodies of different characters with special abilities, using them to solve platforming puzzles, and forcing them to commit suicide so the ghost can transfer to then next required host. Challenging, addictive, and just the right amount of perversion. The player controls a—*drum roll*—lesbian spider queen from Mars who's slaves are escaping. The player must navigate mazes, recapturing their slaves while combating the ones with offensive capabilities. It's like Pac-Man, but enslaving the ghosts instead of fleeing them. The whole package is a well-crafted homage to the great arcade games of the '80s, whatever your stance on the title might be. The hero of this business simulator is Hempy. He's an anthropomorphized hemp plant leaf whose dream is to make a living selling hemp for industrial uses. 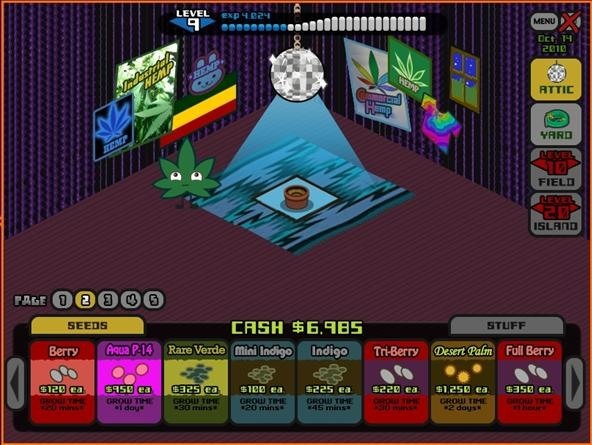 To this end, the player must plant hemp crops of different strains and wait for them to grow. Literally. You plant plants, each one taking a certain amount of real-world time to sprout, then you harvest and sell them (to paper and rope manufacturers, I'm sure). Any game where the majority of the gameplay is not doing or even watching anything is probably not worth the time, except for the most hemp-happy of gamers. However, it does appear to have a following, judging by the FarmVille-like variety of hack and cheat videos available on YouTube for the game.